The first World Cup finals to be televised live in color to a global audience have a special place in the sport’s history. It is regarded as the best tournament of all. Despite the high altitude at which most matches were played and many noon kick-offs in the searing heat of the day to suit European TV schedules, many of the games were of the highest quality. Brazil fielded the greatest side the world has ever seen and not one player from any of the 16 teams was sent off in the entire competition. Holders England and favorites Brazil were drawn to play in the same opening round group and produced a classic match in Guadalajara. Brazil won 1-0 with a goal from Jairzinho, who scored in every match his side played. Pele was denied a certain goal when Gordon Banks made what is regarded as the best save of all time when he dived full length across his goal to turn a downward header up and over his bar. Many expected the teams to meet again in the final as England had a better side than the one which won the World Cup in 1966. Brazil, with Pele at the peak of his powers, were simply awesome. But England were derailed in the quarter-finals by West Germany, who gained revenge for their final defeat at Wembley four years earlier. They beat England, who were missing Banks through illness, 3-2, despite trailing 2-0 at one stage. Hosts Mexico also went out in the quarter-finals. They were beaten by Italy, who went on to meet Brazil in the final after a classic 4-3 win over West Germany in their semi-final match. 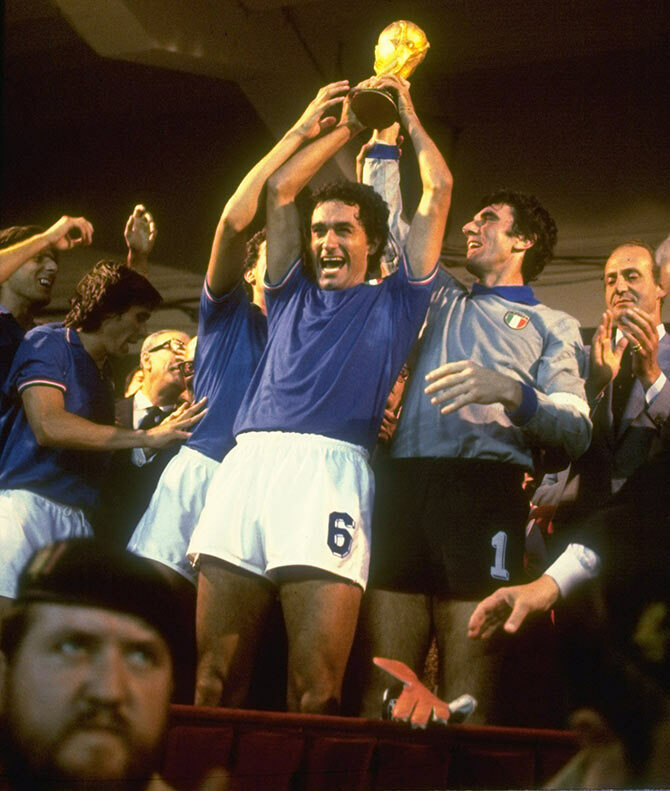 As both Brazil and Italy had won the World Cup twice before, the winners were sure to take permanent possession of the Jules Rimet trophy. Goals from Pele, Gerson, Jairzinho and Carlos Alberto meant the trophy returned to Rio, where it was later stolen and never recovered. 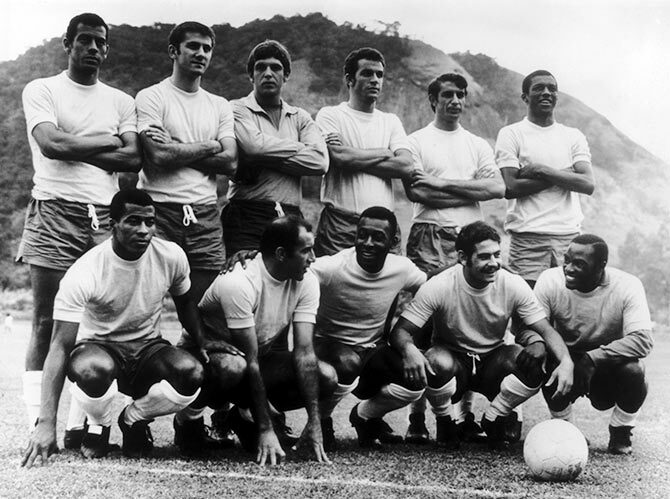 Pele had retired aged 31 and Brazil’s great team had broken up by the time West Germany hosted the 10th World Cup. Unlike the heat of Mexico, most of the matches were played in cold, wet conditions, even though the organizers had used a computer to forecast the period for the best weather. But more than the weather had changed since Mexico. FIFA had a new president, Brazilian Joao Havelange, who was to oversee massive changes in the game during his 28-year tenure. The Jules Rimet trophy was replaced by a new trophy, and there were new teams as well. Netherlands, having shaken off their amateur game in the early 1960s, were back for the first time since 1938 and had developed a new pattern of tactical play under coach Rinus Michels dubbed Total Football. It was a system that demanded every player, bar the goalkeeper, had the ability to play in any position at any time. Johan Cruyff was the focal point of the team, one of the greatest players in history, and he led the Dutch to the final. 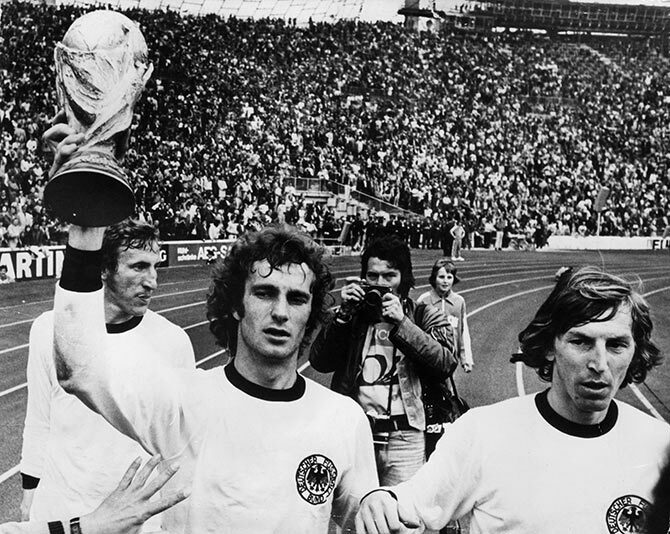 There they met West Germany, European champions and a side skippered by their own all-time great Franz Beckenbauer. The Germans also had Gerd Mueller, one of the finest goalscorers of all time, and Sepp Maier, an outstanding goalkeeper. All three were Bayern Munich team mates, who that year assumed Ajax Amsterdam’s mantle as European champions. They also triumphed over the Dutch in the World Cup final, winning 2-1 at Munich’s futuristic Olympic Stadium after falling behind to a first minute penalty, scored by Johan Neeskens, before a German player had touched the ball. Paul Breitner equalized with a penalty and then Mueller, who had scored 10 goals in 1970, scored his fourth of the tournament to seal victory. It was his 14th goal in the finals, a World Cup scoring record until Brazil's Ronaldo beat it in 2002. Argentina had been bidding to stage the World Cup since the 1930s but when the tournament was finally held there the country was under the control of a military junta. As a result, the finals were played in a tense atmosphere. Several European countries considered boycotting the event or trying to get it moved but FIFA insisted it went ahead as planned. The two biggest names of 1974 were missing, Beckenbauer was playing in the United States and Cruyff, citing security worries, was out of the Dutch side. But new talents were emerging. Brazil were still in the doldrums and the world had a first glimpse of France’s rising talent Michel Platini, destined to become one of the game’s greats and later the president of UEFA. Argentina, coached by the chain-smoking Cesar Luis Menotti, had a fine team which included striker Mario Kempes and brilliant midfielder Osvaldo Ardiles. They strode powerfully, bar a defeat by Italy, through to the final, even if a 6-0 win over Peru in the second phase match which guaranteed their place in the final was seen later to be something of a ‘manufactured result’ between the two South American nations. As in 1974, a superb Dutch team battled through to face the hosts in the World Cup final, and again they gained scant reward for their popularity, enterprise and brilliant play. 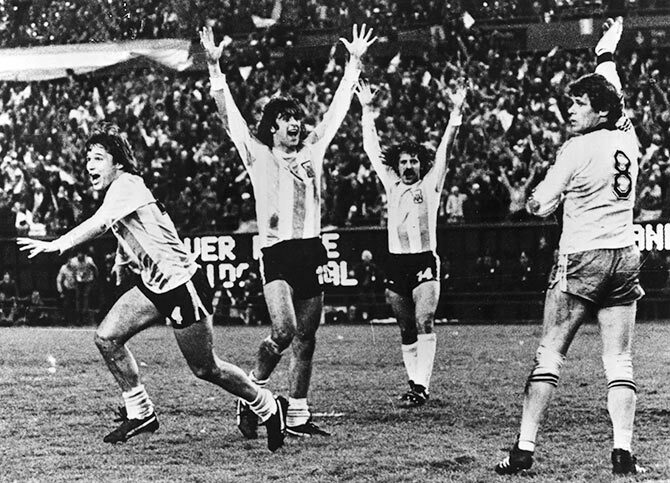 Argentina won 3-1 in extra-time with Kempes scoring twice. An expanded World Cup of 24 teams included an increase in the number of finalists from Asia, Africa and the CONCACAF region of North and Central America but it was the Europeans who dominated the competition. The format, however, left much to be desired. After the teams were split into six groups of four, the top two in each advanced to a second round of 12 with four groups of three. Hosts Spain were eliminated in the second phase after losing 2-1 to West Germany and drawing 0-0 with England, who also went out despite being undefeated in their five matches. Champions Argentina also went out in the second phase, losing to Italy (2-1) and Brazil (3-1), when Diego Maradona was sent off. Italy battled through to the last four after starting the tournament poorly with three draws in their opening group matches against Poland (0-0), Peru (1-1) and Cameroon (1-1). But they came to life in the second phase, following up a 2-1 win over Argentina with a 3-2 victory over Brazil in one of the best World Cup matches of all time. Paolo Rossi, who only returned to the side a few weeks earlier at the end of a suspension for his alleged role in a match-fixing scandal, which he has always strenuously denied, scored a hat-trick against Brazil and then two more against Poland in the semi-finals as Italy reached their first final since 1970. The Germans arrived after their epic victory over France in the semis in Seville when they battled back from trailing Michel Platini’s side 3-1 in extra-time to force a 3-3 draw, eventually going through on penalties. But they went into the final with their best player Karl-Heinz Rummenigge not fully fit. He went off soon after Italy took a 2-0 lead in the 68th minute of a game which they eventually won 3-1 to become world champions for the third time. Rossi maintained his scoring form with the opening goal early in the second half while Marco Tardelli and Alessandro Altobelli added the others. Paul Breitner scored a late consolation for the Germans.